Is it a good school? I received many dire warnings from people (whom I had never met before) who were concerned that my three-year old wasn’t in school yet. The main concern was that I was a social recluse, maybe even a Stig of the dump, and perhaps hadn’t realised that I lived in a town with schools. Secondary to that, they worried – more likely scenario – that I wouldn’t find a place. Since there are nine or ten state schools in my municipality, I didn’t think that was very likely. I mean, I can’t be the only crazy mum out there that is still at home looking after a baby and that doesn’t pack the older one off to school as soon as the government is willing to relieve me of her. After all, I’m already putting her in two years before real school starts. But, they said, you won’t get a place in a GOOD school. What are the good schools? I asked. They listed four or five in my town, so I relaxed and ignored them again. The chap at the Education Department of the Town Hall also labelled two of the closest schools as “good”. So what is a good state school? Oh, and of course we would love to have great facilities and fabulous teachers, but from what I have found out, there isn’t all that much variation between the local state schools (which is as it should be in publicly funded schools, after all) and we may only find out the differences by actual experience. When I visited the school that the chap at the ayuntamiento intimated was the best in the neighbourhood, I mentioned his accolade. Oh no, replied the lady who fielded my questions. “Todos los colegios son iguales,” she insisted. If I had moved here with a seven or eight year old, then sending them to a centro bilingüe school with some classes in English would be a very high priority for me. I can imagine that total immersion for kids that age and who don’t speak Spanish in a curriculum designed for native speakers would be quite a baptism of fire. But at four, when school is more about playing, I’m hoping it won’t be too bumpy. In the two years of preschool before any classes in English are introduced, I think – I hope - that my daughter will learn to function well enough in Spanish. Some days I’m confident – after all, she is already bilingual, and she’ll find Spanish very similar to French. Plus she has a head-start on reading, so she won’t struggle with the actual material, just with the communication side. Other days I just play the stressy mummy role. Perhaps being in a centro bilingüe would make some classes easier. Perhaps I would understand more about those classes. Perhaps she would even learn some English vocab that I am not likely to use with her. But at the end of the day I think it is down to me to teach her proper English with a wide vocabulary and a deep love of learning so she can fill in any gaps I leave. It is also down to me to keep up with understanding her education and her homework, and I’m determined to make that happen. Besides, it could even be irritating to be in a class of complete beginners being taught English by a non-native speaker. The same goes for French. As for the timing of the school day, all those in the area stick to the shorter day, so that turned out to be a non-choice. So when it actually came to filling in the form, listing our choice of five schools in order of preference, we simply named the closest school as top choice. Followed by the next closest schools. Phew. All that research to end up back where I started. What was I saying about stressy mummies? On a positive note I discovered evidence that some schools in Andalucia use Cuisenaire rods (regletas) to teach maths to five-year olds in Infantil. As you know, I am very interested in these rods and the similar colour factor sets, so I’m delighted to know there are some like-minded educators in the area. You would think that passing on your mother tongue to your children would be straightforward. Actually, if you speak a well-regarded, globally useful language, it isn’t particularly hard. Relatives on both sides of the family will support you and even be grateful you can pass on a language which will boost the kids’ career prospects. There is a plethora of materials available. People won’t look at you strangely in the street. People won’t erode your determination by suggesting that your speaking your native tongue is hindering their progression in the majority language. You can look at it this way: if English is the minority language in your family, you needn’t worry because it’s the majority language of the world. The same is true of other “major” languages, to a lesser degree. 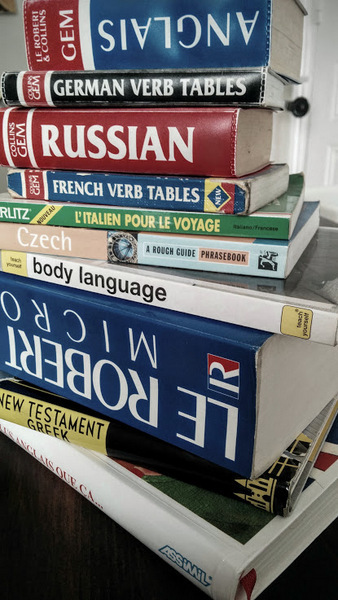 I really feel for parents trying to transmit equally important heritage languages, but which are less well known or considered of little use in the business world. Still, even with a “major” language, there is one element which can make it hard to pass on that language as fully or as consistently as you had planned. I tend to think of it in terms of a current. Immersion works because you end up being carried along by the current. As soon as your kid goes to school, they’ll not only learn to swim, they may even be carried away by the majority language to the detriment of their minority language(s). So they need you to provide a strong enough flow in your language for them to swim in that direction too when they choose. But as a parent living in a foreign culture, you, too, need to learn the local language. Just because you want to pass on a family language doesn’t mean that you don’t want to integrate your host country. Anyway you need to talk to teachers, doctors, and so on. So mentally you are pushing yourself into the local-language current, trying to learn to swim in that direction. This makes for a linguistic struggle in your head, because you too end up being carried along by the majority language, even though it may be your weakest language. On the one hand I desperately want to ease the transition into school for my rather reserved daughter. I want her to know some basic vocabulary, to be able to express basic needs. I also want to keep up with her teachers, her playmates, her homework. On the other hand I want to keep providing a decent flow of English interaction when she is with me, and also support our other minority language, French. Not to mention continuing to support a modicum of Arabic exposure. I already try to speak French with their dad during mealtimes so the kids are more immersed in it. I can’t afford for the majority language, Spanish, to steal any of my linguistic effort, when the last thing my kids need to hear from me is Spanish because they will be thoroughly immersed at school. So my plan is to start Spanish lessons in the autumn, when my oldest goes to school. But I know this will mean a battle of currents. I know I’ll have to fight against Spanish expressions slipping into my speech, fight against the tendency to choose vocab from the top of my head which would mean muddling it all up, fight against talking in sentences that would raise monolingual eyebrows. Some people succeed with a more relaxed approach, but I need consistency, so does my routine-loving daughter, and so does my 19-month old who says his 40 odd words in three languages and I’m sure will end up being on the receiving end of an avalanche of Spanish once his big sister comes home from school and wants to play teacher on him, poor thing.